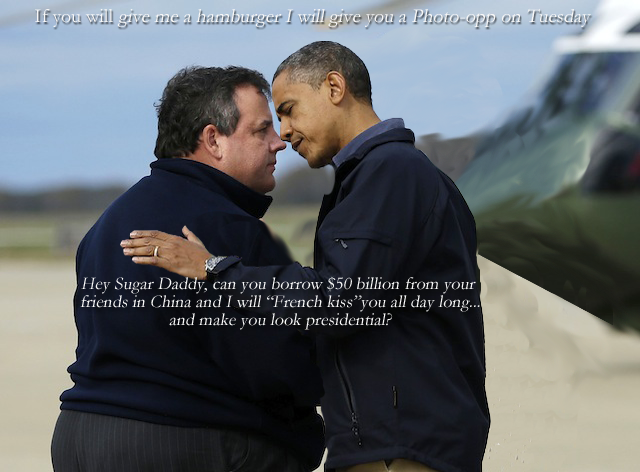 After Chris Christie (Governor of New Jersey) went running to the Sugar Daddy Obama for Washington hand-outs; Christie essentially threw the race for Obama. Christie had an opportunity to invite both Romney and Obama out and be fair to both candidates. He chose greed over conviction. Since the federal government is less than broke, where does FEMA plan on getting the funds to give to Christie? Why should the cost to rebuild New Jersey be absorbed by the entire country - especially since we will have to borrow the money and pay back the interest to a hostile foreign nation? By the way it is November 11th and FEMA and the federal government is no where to be found in New Jersey! Obama will be going out to the east coast for more photo-opps but the people of New Jersey and New York are still digging out of the rubble with no heat, food, or electricity. I can guarantee you that Christie has been stuffing his face with a feast of holiday cheer, and Obama is back to the White House eating like a king and indulging in his vices as well. I will be soon launching a website to raise funds for whomever runs against Chris Christie and will be in touch with the New Jersey Democrat Party to let them know of my efforts to unseat Chris Christie. We need to send a message to our fellow Republicans when they cross the line of loyalty. We were at the crossroads of capitalism and socialism - and Christie could have very been the determining factor of which direction we will go. Exit polls showed that nearly 48% of voters said that Obama's handling of hurricane Sandy is what lead them to vote for Obama. The American electorate is very capricious and will change their vote on sound-bites and photo-opps. Republicans need to know that they didn't lose the election over issues but rather these shallow aforesaid reasons. Politics has and always will be a retail business in that those who win elections are the ones that are portrayed as the most charismatic. 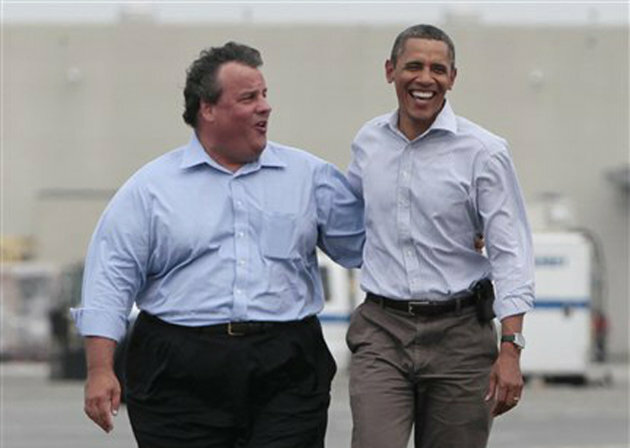 This election being lost over the photo-opp that Christie gave Obama came as no surprise to me. The day I saw the two hugging and slobbering over each other; I knew the election was lost. As a webmaster I will have the website on page one of Google for many of search terms and will run a very effective fundraising campaign against Chris Christie. The damage to New Jersey pales in comparison to the damage that Obama's socialism will do to the country. ObamaCare will strip women's rights in that mammograms will not be performed on women until they are 50 years old; because of this hundreds of thousands will die because they were deprived of the early detection of breast cancer. Senior citizens will be denied life saving surgery, getting into a family practice physician will be worse than an HMO program, medical doctors will leave the profession due to the low wages and our quality of care will drop to that of Canada or England. So a generation of doctors and patients will suffer; this means nothing to the long-range planning typical of socialized governments. As Stalin said "You have to crack a few eggs to make an omelet". Back to the presidential race... By the way did you know that we (The United States) have fulfilled nearly all the tenants of the communist manifesto? We don't call it Marxism but a rose is a rose by any other name! The momentum that Christie took out of the Romney campaign was enough to turn the race for Obama. What Chris Christie did was take the message from Bengazi and Obama's absentee presidency to photo opportunities for Obama to look like Commander in Chief. Obama has been Golfer in Chief and Campaigner in Chief for his 4 years in office while Pelosi and Reid rammed every socialist policy through congress controlling both house and senate; and his cabinet did end runs around congress to abrogate congress. Obama and Clinton have been working on subjugating us to the UN which can be evidenced in UN observers brought over here to "watch" our elections and protect them from fraud. This was two fold, 1. to symbolize the loss of sovereignty of the United States and 2. to watch only Republican districts. Clinton and Obama will get a UN tax on all of us an also outlaw guns through a small arms treaty. This is in direct opposition to our constitution - but Obama has never respected the authority of the Constitution so what's new? "Hey tell Burnake to get the printing presses going or call Beijing"
As the month rolls on I will begin a newer site with a better platform to rank in the search engines for several key-words so that while we are feeling the scourge of Obama's socialistic policies in the coming months, we can direct some of the anguish back towards those who played a role in betraying the Republican presidency and conservative policies. Is this returning evil for evil? No this is an exercise in civil responsibility and voting those out of office; we will be voting those out with our money if we don't live in a state where we can cast a ballot. $5 to Defeat Chris Christie is All it Takes - If we get $2 million Republicans to donate we got him! We will be asking for small donations but will reach millions through the Internet; our goal: to send a message to those who put their greed before their country. Chris Christie has done just this; he agreed to give Obama a chance to repair his partisan image in return for some FEMA funds; and in doing so, sold out the country to a Democrat platform of abortion, homosexual marriage, and socialism. For this we will send a message to the Governor of New Jersey. Keep your eyes open for the coming website to defeat Chris Christie because of SandyGate.